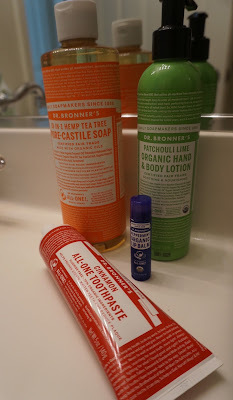 It's safe to say that I'm completely obsessed with Dr. Bronner's products! Dr. Bronner's products are all ethically sourced, fair trade. They sell body care, oral care, food (coconut oil) and cleaning products. I have been purchasing their products for a very long time and have yet to be disappointed. Cinnamon All-One Toothpaste. This tasty toothpaste is fluoride free, vegan and cruelty free with no artificial flavors, colors, preservatives or sweeteners. It leaves my mouth feeling so fresh and clean! & if you like cinnamon, this you will love. This toothpaste is non-gmo verified! Peppermint Organic Lip Balm. Love. Lip balm is my fav and this one definitely does the job! It is made with organic beeswax which provide a protective barrier to the elements with no synthetic ingredients. Organic jojoba, avocado and hemp oils are also in this lip balm helping bring in that extra moister. 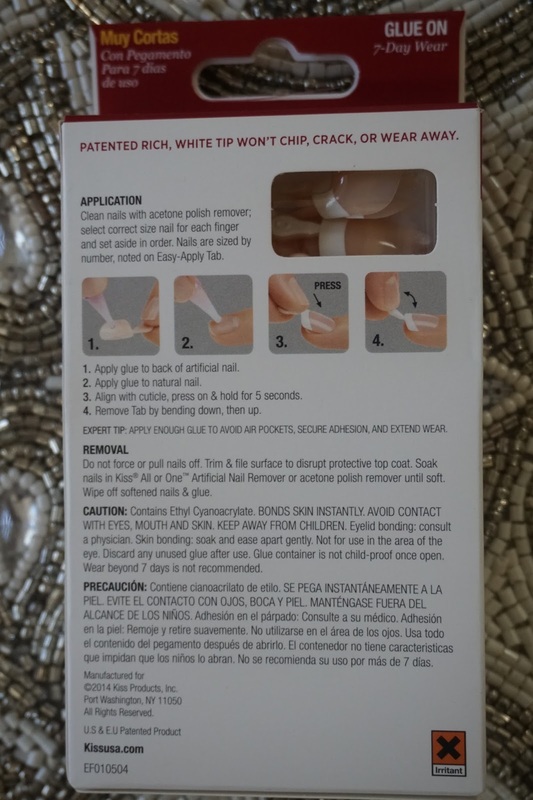 It has a minty scent to it but it doesn't have any type of burning sensation on the lips. Did I mention this lip balm is certified organic?! Gimme. Patchouli Lime Organic Lotion. This organic hand and body lotion is my new-found favorite. It is a light weight lotion but is SO incredibly moisturizing and luxurious! It has a very spa-like quality feel to it while remaining affordable. I am very picky about my lotions because of the fact that I rubbing it all over my body meaning a decent amount of product it's entering my bloodstream. This one is legit. I'm completely obsessed. Tea Tree Pure-Castile Liquid Soap. Ok, this 18-1 soap is unreal. This soap is good for just about any cleaning task. You can use this soap on your face, body, hair, food, dishes, laundry, mopping, pets, the list is endless! It also smells delish. This soap is available is 6 different sizes so if you are looking to test it out before committing to it you can start by trying out the 2oz bottle at only $3.19. It is also made with certified organic and fair trade ingredients while being cruelty free and vegan! 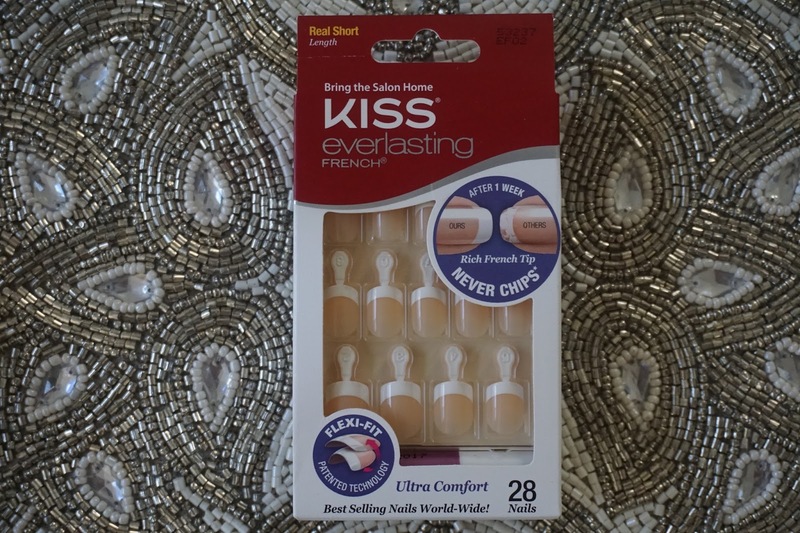 Press-on nails?! I didn't even know these were still around until one of my gfs snapped a picture of her nails that looked absolutely flawless and she told me they were press-ons!! She then told me the specific brand that she always uses and loves so I immediately went onto google and found them on walmart.com for $4.97 and purchased 3 sets. I also found them HERE on amazon. Since this was new to me that people even still used these I figured this could be a helpful post for others as well. 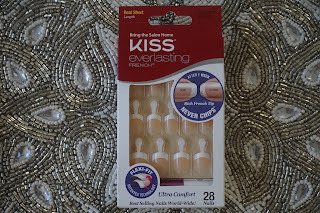 They are inexpensive and super easy to use. 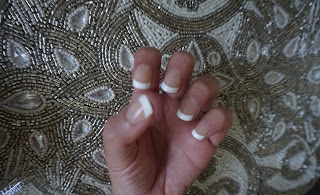 If you are anything like me, almost every time I get my nails done at the salon, I find something wrong with them. They are either crooked or too sharp in a certain spot or too long/short or something. With these, you know what you're going to get and they're great quality (for 24 hours). Now, when I tested these out, I made sure I wasn't rough on them at all, so don't put them on and go do some gardening LOL. I lost my first nail about 27 hours after applying them. I simply bumped it on the couch and it popped right off. Once that one popped off, I slid my remaining nails under the other ones that were still intact and they came off very easily. My gf said she has the same issue with how quickly the nail glue loses its stick and is going to try gorilla glue one of these days, HAHA! 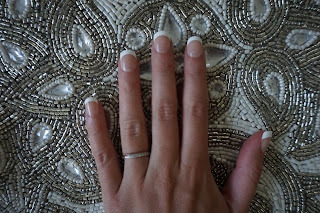 If you have a specific event or date where you're wanting a nice french set of nails, I think these are perfect. Often, we have an event coming up and we think, "I have to get my nails done for this" but its only for one day. 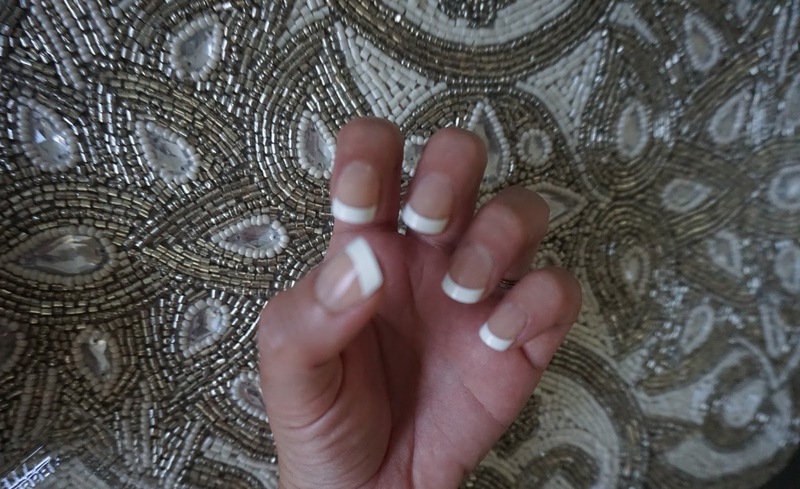 $40-60 for a full set of pink and whites at the salon vs. less than $5 for these press-on nails is something to think about. Okay, guys...I wasn't going to do a post on the Nordstrom Anniversary Sale but I just HAD to tell you guys about my favorite purchase that I grabbed during "early access" that is worth every dollar and you won't be able to find it at this price anywhere else after this sale! HERE is where I got mine. $66 off!!! Unreal. I have debated on getting a Clarisonic for some time now and when I saw this deal I knew it was time. This device has been getting my skin cleaner and smoother and brighter and all around better than anything else I have, possibly ever, tried. I am OBSESSED. If you don't want to take my word, go check out the reviews on this thing! Its compact size is just perfection as well. uhhh... LOVE. & while we're here and talking about the Nordstrom Anniversary Sale, I should include that my favorite deodorant of all time that I'm constantly raving about is also on sale in a bundle HERE! You already know I stocked up ;). Do you only use "green" beauty products? I was 18 years old when I moved out and went away to college. What do you do for acne? Fortunately, I wouldn't consider myself to have ever suffered from acne, but I have helped many people when it comes to their acne. Short answer- your diet. Long answer- you really have to find out what is triggering your acne and for most, it's in their diet. You really have to detox and clean out that gut. I've noticed that dairy has probably been the biggest trigger in those I've helped in the past but there are SOO many different foods that can trigger acne, so I recommend keeping a diary and any time to you experience a break out go back and look at what you ate. Focus on the type of acne you're getting and do a little google research on what my be triggering it. Also, focus on where you're developing the acne. Remember to always dry your face after washing it with a fresh, clean towel. Wash your bedding and pillow covers as much as possible. Don't touch your face. Unless you're apply or removing your makeup, fight that urge of any type of contact with your face. Let your skin breath as often as possible. Try to eliminate as much stress in your life as possible. One product that I've seen work wonders on many clients is the La Mer The Concentrate. You can go to that link and check out all of the amazing reviews and see if it sounds like something that may help you. There are also great reviews on Nordstrom's website. I love all of the Real Housewives shows on Bravo. I love Bravo in general lol. & I recently started Scandal and am now addicted to that as well. I have an old sister whom is almost 3 years old than me and then I have two step-siblings, one boy and one girl, whom are 15 & 13. My big sister is actually getting married next year and I'm oh so excited to be her maid of honor! No, I do not. I like my all around beauty routine and upkeep to take as little time as possible and back when I was getting my hair colored I wasted endless amounts of time sitting in that hairdressers chair. & my hair grows so ridiculously fast that my roots would look horrible within a few weeks. We as girls and women already have so much to keep up with when it comes to our hair, nails, makeup, shaving, outfits, etc. so if I can cut anything out or make something easier I'm all about it LOL. If I were to ever put color back in my hair I would definitely do it myself at home as it's so much less time consuming! Non alcoholic? Water! All day every day. Luckily, I truly enjoy the taste of water so it's very easy for me to drink a ton of it! Alcoholic? Red wine! Yesssssss, girl. Ok, this one is impossible for me to answer LOL! I'm sorry!! I wish I could but there are literally a ridiculous amount of brands out there right now that there is no way I could possibly choose one! I love way too many! I have two doggies :) One maltese and one catahoula leopard dog who are my everything! Yes, it is :) & I'm forever thankful I get to do something I love so much! Serotonin is a chemical found in the body that can benefit us in various ways if we make sure we're getting the proper amount. eliminate sugar. If you have intense sugar cravings this may be your body's way of trying to increase serotonin itself because eating sugar produces insulin which helps tryptophan into your brain (listen to your body). foods. Eggs, cheese, pineapple, tofu, salmon, chocolate, bananas, tomatoes, nuts & seeds, turkey & others boost serotonin levels. While serotonin is well known as a brain neurotransmitter it's estimated that around 90% of the body's serotonin is made in the digestive track so we must take care of our guts! Avoid simple carbs and focus on the complex carbs. exercise. Get up & move!! sunshine. Even if it's just 15 minutes a day. avoid caffeine. 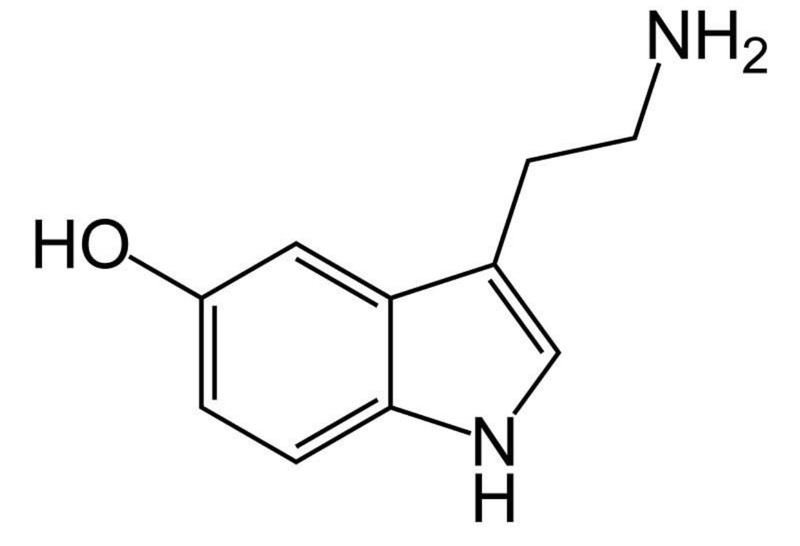 A lot of people don't like to hear this one, but caffeine suppresses serotonin. positivity. Eliminating stress can help drastically. Smile more. Did you know smiling alone boosts neurotransmitters, calming your nervous system and stabilizing your mood in the midst of everyday stressors. Surround yourself with happy, positive people. & if you have to be around someone you dislike at school or work, remember -You control your own thoughts. You have the choice to react any single way you choose to, in every single situation that happens to and around you. Change your thoughts, change your life! 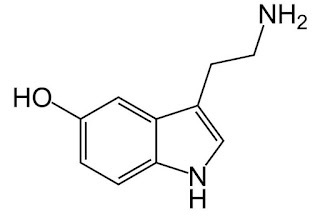 vitamin b6. Take your vitamins! omega 3. On top of getting your healthy fats through food, taking an omega-3 supplement also helps. This is one of my all time favorite vitamins to take as it has SO many great benefits. massage. Human touch triggers "feel good" sensations. & if you aren't in the position to get a massage, playing with a pet helps trigger these same feelings. sleep. Make sure you're getting the proper amount of sleep that your body requires. This one is HUGE! chocolate. Woohoo! An exciting one! Yes, eating dark chocolate alone improves serotonin levels, partly because of resveratrol. Yum. I really hope you've learned something from this post and you're able to live an all around happier lifestyle! Love you all!! Winner, please send me an email at ErinLCoakley@gmail.com leaving your mailing address so that I can forward your information to Loli. Loli Beauty Box is a subscription box company that delivers farm-fresh products including skin, hair body & bath blends right to your front door. 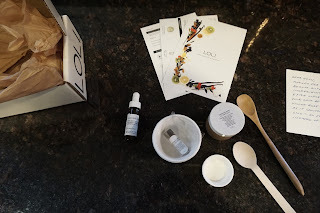 I loved every single product in my box and they now want my readers to have the chance to try out one of their boxes for themselves! 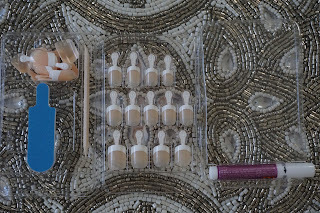 It was so fun mixing these treatments and the results left me with glowing skin! This is a giveaway you don't want to miss out on! & Simply leave a comment in the comments below letting us know why you would like to win this giveaway! It's that easy!! *The winner's name will be announced Friday Morning (July 15th)! Make sure to check back if you choose to enter! 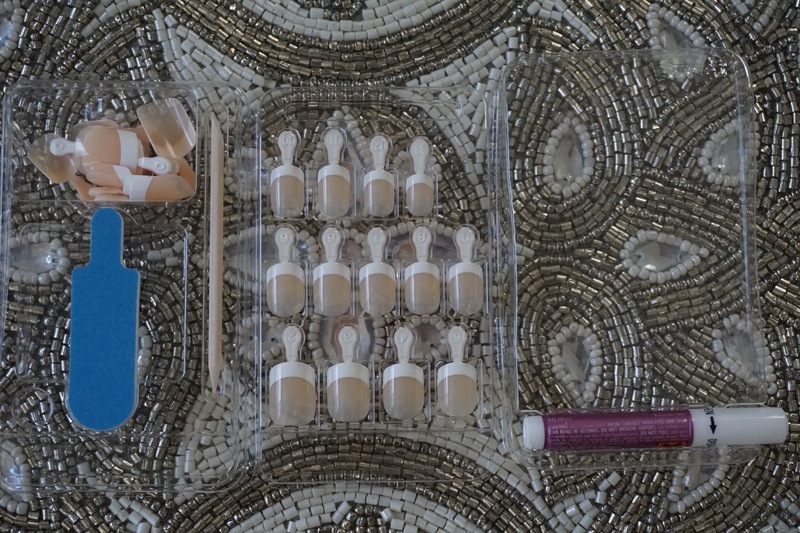 All three of these products are absolute staples in my beauty routine. I have been using each of these for at least a year now so I'm 100% confident in my reviews on them. It's safe to say that I'm absolutely obsessed with each of these products. Donna Karan Cashmere Mist Deodorant- I cannot say enough good things about this deodorant! It smells AMAZING!!! I have never, ever smelled a deodorant that smells this good, ever. It doubles as a perfume; You could literally just put on this product and not even need to wear a perfume because it makes you smell-> That. Good. It is super long lasting and blends into your skin flawlessly. I have yet to find a deodorant that even compares to this. LOOOVE. it Cosmetics Your Skin But Better CC Cream- This is a full coverage CC cream that I am absolutely obsessed with. I wear it any time I plan on getting sun on my face because of the 50 SPF (protect yo-self). I wear the shade "light" which matches my complexion like no other. It blends seamlessly and is long lasting. Ugh, theres just nothing bad to say about this product. Obsessed. it Cosmetics has this same product but in an illuminating version that I just ordered because I'm so in love with this product and anything illuminating is calling my name, hello! Let me know in the comments if any of you have tried the illuminating one and what you think about it because of course I can't just wait until it gets here. Oscar Blandi Hair Serum- Okay, if you want your hair to shine bright like a diamond, this is your stuff, gf. & I'm talkin' silky, goddess shine. I just apply the smallest amount to my fingers and put it all over the ends of my hair after the shower when my hair is still damp. This one bottle has lasted me forever and still hardly has a dent in it! Gimmie. This Spring & Summer my face has been more dry than usual and I was in serious need of an intense moisturizing treatment so I began my hunt. I tested out a ton of different moisturizers and this product knocked them all out of the park, by far. This moisturizer is definitely on the pricy side but trust me when I say it's totally worth it. 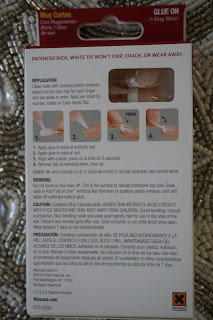 This creme has totally transformed my dry skin into glowing, radiant skin, leaving it without any dryness at all. I'm a huge advocate when it comes to taking care of your skin at all costs, so I can completely justify expensive skin care. Like, hello!... you only have one face that you have to live with your entire life. Take care of it!! 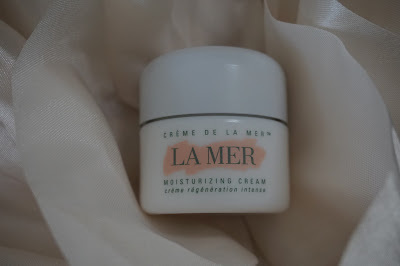 I have now purchased more of La Mer's products to experiment with because if they're as good as this moisturizer, I need them in my skincare routine pronto.